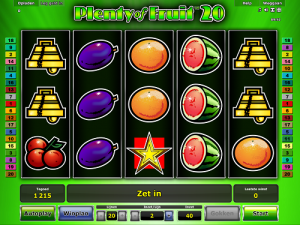 Plenty of Fruit 20 is a classic slot game, which is full of fruits and other classic symbols! This game is perfect for beginners who are looking to upgrade from a simple 3-reel, 3-payline slot but who don’t need something super complicated. Although this slot doesn’t have any bonus rounds or games, which more well-seasoned slots players might be looking for, this is what makes it great for beginners. It’s easy to understand, lucrative and fun to play. Fans of Jolly Fruits, Sizzling Hot Deluxe and Ultra Hot Deluxe will enjoy Plenty of Fruit 20! Brought to you by NovomaticCasino.co.uk, Plenty of Fruit 20 slot game is packed full of classic, old-school slot symbols. Almost 200 years have passed since the first ever slot machine was invented and, while technology has advanced and made significant changes to the way we live our lives, some slot machine symbols have stayed the same! Plenty of Fruit 20 slot game symbols include: red cherries, lemons, oranges, juicy watermelons and ripe plums. Other symbols, such as: a golden bell, a red seven and a golden star also appear on the reels. In order to get a payout, you’ll need to spin at least three matching symbols on consecutive reels, from left to right. You can check the paytable to see how much each combination of symbols will pay you, according to your bet. The red seven symbol is the Wild symbol and this substitutes for all other symbols except the Scatter. The Scatter symbol in Plenty of Fruit 20 is the golden star and this pays out wherever it lands on the reels. Your balance, last win and bet amount are all clearly displayed for you at the bottom of the screen. If you want to change your bet, you can use the plus and minus symbols to increase or decrease the amount you wish to bet on each line, but you’ll need to bet on all 20 which means the minimum bet is 0.20 for each spin in Plenty of Fruit 20 slot game. You can put the game into ‘autoplay’ mode if you’re bored of clicking. In this mode, the reels spin themselves and you can watch them spin without you having to do a thing! The only things you can’t do in autoplay are gamble your wins or change your bet. Gambling your wins are a great way to increase your balance quickly. With the gamble feature, you have the opportunity to gamble your win again and again and again! All you need to do is guess correctly whether you think the next card in the stack will be red or black! Get it right and you’ll double your win, with the chance to do so again, but get it wrong and you’ll lose your win. Here at NovomaticCasino.co.uk, we have so many games that you can play a new game each day of the year if you want! They’re all great and they’re all super entertaining! Our slot selection includes plenty of jackpot slots which regularly give out massive jackpots and these include the likes of: Jingle Jackpot, Jackpot Crown and Gemstone Jackpot. Aside from our jackpot slots, we also offer players a wide range of table games and live dealer games which they can stream straight to their computer or mobile device. Our table games include Sic Bo and Royal Crown 3 Card Brag and, like our slots, offer great RTP (return to player) percentages. Our live dealer games are made using the latest technology and offer players a super-realistic way of playing casino games from the comfort of their own home. Play with a real dealer at a real table, in real time, and get a sense of the authentic casino vibe. Choose between: Live Poker, Live Roulette, Live Blackjack and Live Baccarat. Load one up and transport yourself directly to Vegas!